As I’ve admitted to a time or two before, I’m a huge soccer fan. So please bear with me on yet another soccer analogy. Everyone knows that to win in soccer you need to score more goals than your opponent. Therefore, scoring a goal is crucial. Now there are many ways to score, but crosses (passes from the outer parts of the field into the front of the goal) account for something like 70 percent of all goals. (At least that’s what my old coach used to say.) One could conclude that if you cross the ball a lot, you’ll score a lot, and a very simplistic strategy would be to cross the ball whenever possible. But if you watch the top teams in the world, they don’t do that. Why? Because crossing is a top-of-the-funnel action, and not the objective in itself. Most social analytics are really good at measuring these top-of-the-funnel actions. They show how many impressions each post and hashtag gets and surface what content gets ‘likes’ on Facebook or ‘favorites’ on Twitter. And then, finally, they measure link clicks. 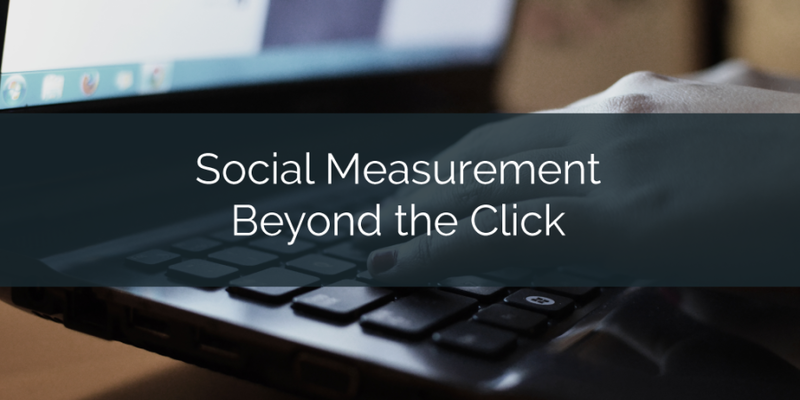 The click has become the final measure of social marketing success. Likes, follows, and link clicks are the soccer crosses of social marketing. More clicks typically results in more conversions, but the best crosses – the best clicks – make it a lot easier for the ultimate conversion to happen and make conversion rates go way up. In an analysis of a soccer player’s performance, a coach would never stop at the moment of the cross. He’d see if it maintained possession, set up a teammate in a good position, and ultimately, if it resulted in a goal. However, when it comes to social marketing, from a data perspective, the social team loses the customer journey after the click. Social hands it off to web analytics to take care of the rest. Because they’re separate platforms, they track things slightly differently and have their own methods for attributing traffic. The data may not be quite as different as apples and oranges, but it’s at least Fuji apples and Red Delicious apples. Platform integration just isn’t where it needs to be for this hand-off system to work effectively. Furthermore, social marketers lose control because web analytics is typically run by a different team (ecommerce marketing, web marketing, etc.). At best, after the click, social marketers are moved to the passenger seat. Usually, however, they’re blind to it. They think that since they got the customer to the link click, the social media part is over, it’s now up to the web team. It’s like a soccer team having a coach that only focuses on crossing, but has no data or insight about the goals being scored as a result of them. Just like a team scoring a goal, the customer journey beyond the click is where the action really matters. It’s where the needle moves. And it’s a reason why social hasn’t received the credit it deserves. If social marketers want to be an important part of the business, they need to know what happens in the land beyond the click. They need to be connected – to the web team and to the data. Getting 10 percent more likes or even 10 percent more clicks than last month is great, but that’s not the whole story. If you’re also seeing 10 percent fewer conversions on site, there is a problem. Or vice versa: likes and clicks may be flat, but if the downstream conversions are going up, social is providing business value. It’s wrong to assume that all top-of-the-funnel engagements are equal. You may be getting likes and impressions from the wrong audience, or targeting your content to the wrong point in the customer journey. It can look great when looking at social engagement metrics, but it isn’t providing optimal value for the business. It’s like crossing the ball when none of your teammates are in the area to get on the end of it. The stats look good, but ultimately, it’s useless. What happens after the click is a crucial component to a well-run marketing effort. To close the loop on how successful any social effort is, post-click insight is needed. Only then will you be able to improve and create and post the best content – not for social engagement stats – but for the organization. Become an integral employee to your organization – the ultimate assister, and demand that insight.